Nashville Aikikai hosted a seminar with Tres Hofmeister Sensei on October 5-7, 2018. Nashville Aikikai hosted a one day seminar with Tom and Mary McInitire Sensei on Saturday, August 11. 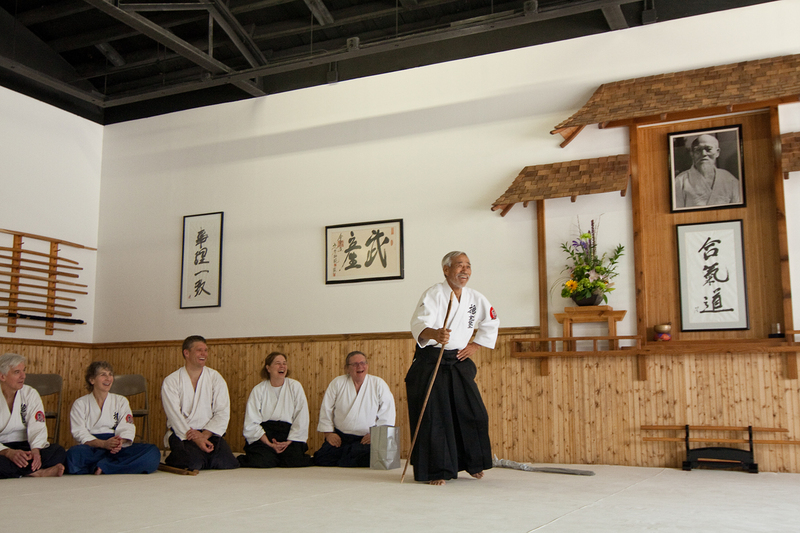 Nashville Aikikai celebrated its 30th Anniversary with a special seminar with Ikeda Sensei. Thanks to all who came out! 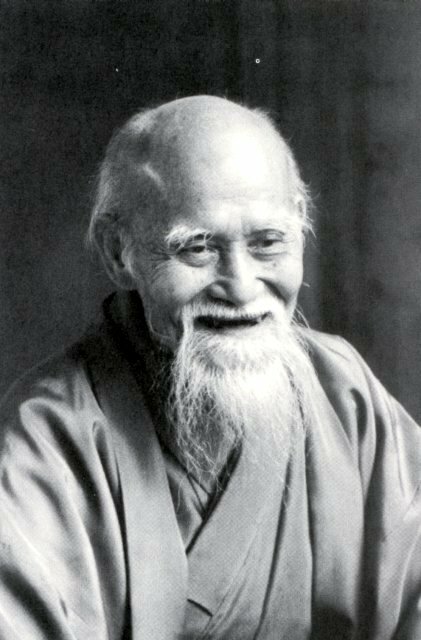 Hiroshi Ikeda Shihan March 24-26, 2017. Tres Hofmeister Shihan October 14-16, 2016. We are honored to announce that Ikeda Shihan of Boulder Aikikai will be teaching a seminar at Nashville Aikikai on May 22-24, 2015. Registration is $150 for the entire seminar or $50 per class. Pre-registration is requested, but not required. Please see flyer below for more details. We are honored to announce that Saotome Shihan, Founder and Supervisory Instructor of Aikido will be teaching a seminar at Nashville Aikai on March 27-29, 2015. Registration will be $150 for the entire seminar or $50 per class. Pre-registration is requested, but not required. 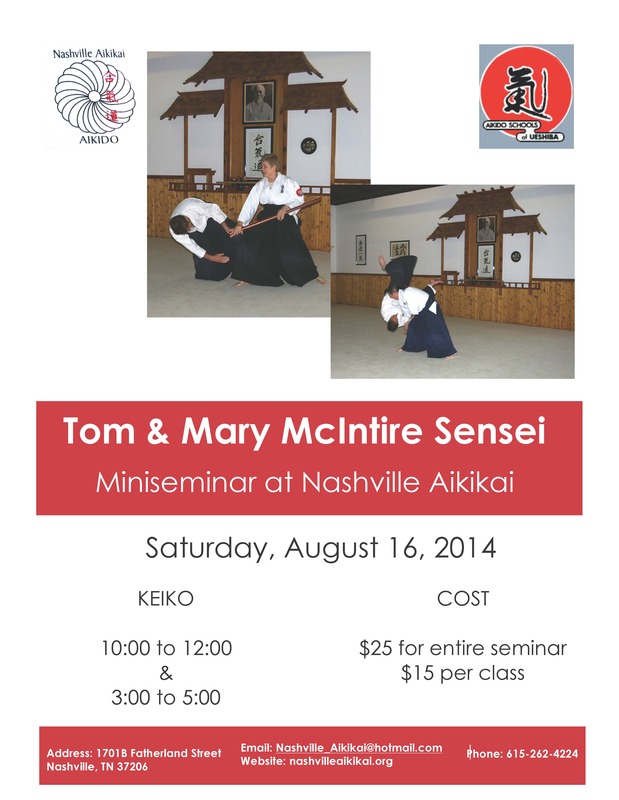 Please join us for a one-day seminar with Tom and Mary McIntire Sensei at Nashville Aikikai. Please see flyer below for details. 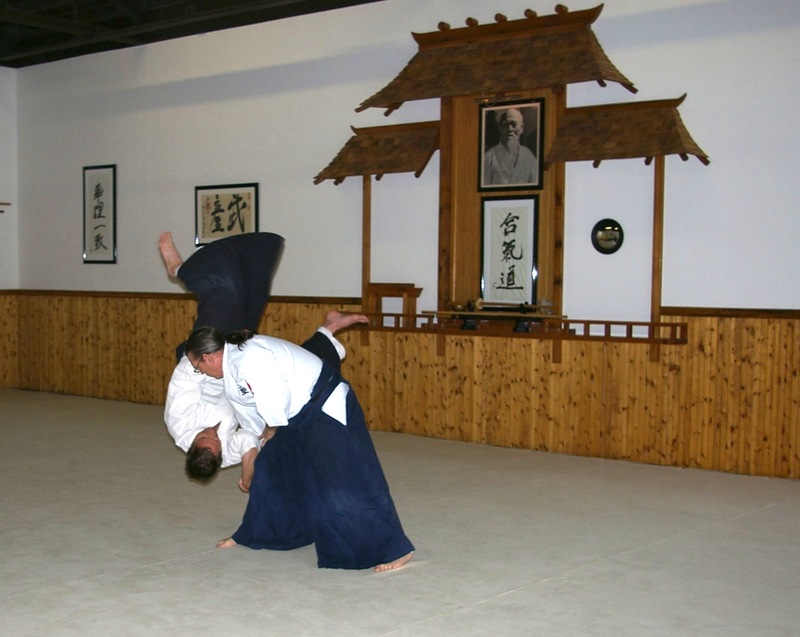 We are excited to host a seminar with Tres Hofmeister of Boulder Aikikai on September 5-7, 2014. Registration is $150 for the entire seminar or $50 per class. Pre-registration is requested, but not required and is due by August 29, 2014. Please see flyer below for more details. 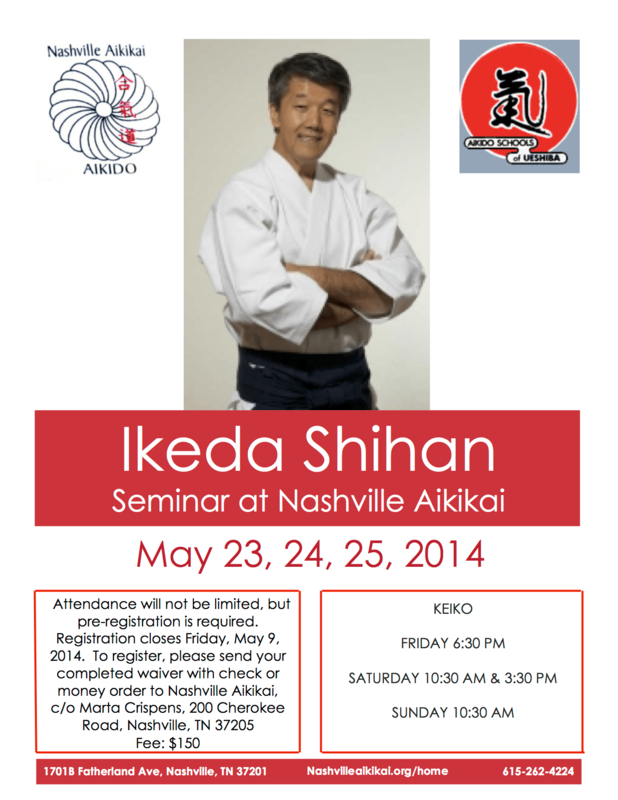 We are excited to host a seminar featuring Ikeda Shihan on Memorial Day weekend. Registration is $150 for the whole seminar. Pre-registration is required and due by May 9, 2014. Please see the flyer below for more details. Nashville Aikikai is once again privileged to host a seminar with Soatome Shihan. 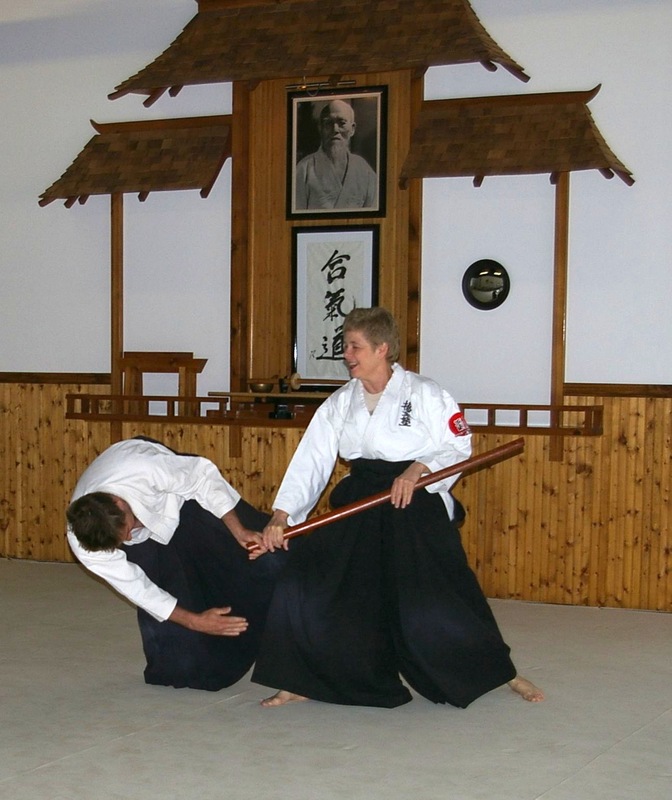 Our senior instructors, Tom and Mary McIntire Sensei, will be teaching a mini-seminar at the Nashville Aikikai dojo on Saturday, December 14, 2013 Cost: $25 for the entire seminar, $15 per classes. Classes will be 10:30 to 12:30 and 2:30 to 4:30. Please join use for great training! Click the link below to see the seminar flyer. 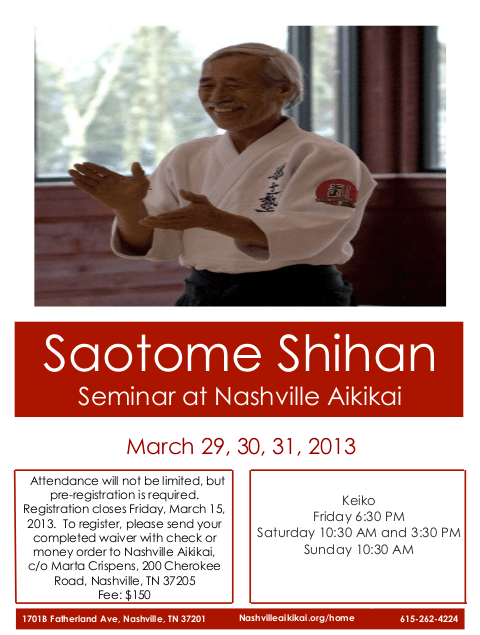 Nashville Aikikai is honored to once again host a seminar with Saotome Shihan. The seminar will be held at Nashville Aikikai on March 28-30, 2014. Seminar cost will be $150.00. Attendance will not be limited, but we do request advanced registration. Please send your check and completed waiver to: Nashville Aikikai, c/o Marta Crispens, 200 Cherokee Road, Nashville, TN 37205. Registration closes, Friday, March 14, 2014. Keiko will be Friday at 6:30 PM, Saturday at 10:30 AM and 3:30 PM, Sunday at 10:30 AM. We will be serving dinner in the dojo on Saturday night. Please contact us if you need housing, as we do have housing available in the dojo. Aikidoka of all affiliations are welcome. Please bring your aikido weapons. 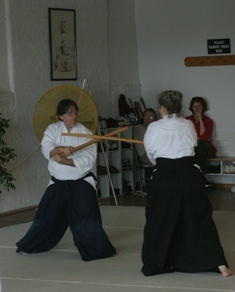 Wendy Whited Sensei at Nashville Aikikai, July 2013. Thank you to Whited Sensei for a great seminar and congratulations to Cassandra, Jason, Travis, and Andres on 4 great Dan tests. Testing will immediately follow the afternoon keiko. The seminar will cost $25 for the entire day, or $15 per class. 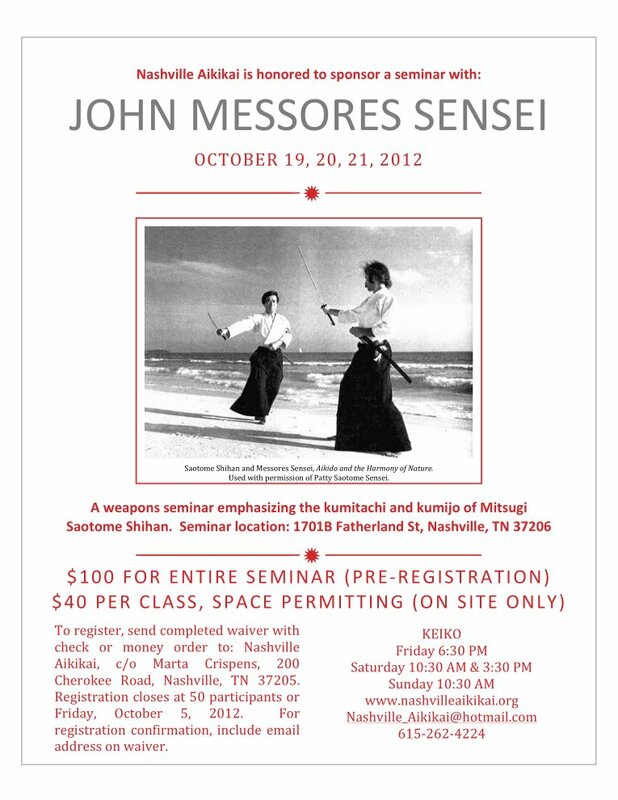 All Nashville Aikikai students are highly encouraged to attend. Please email dave@nashvilleaikikai.org for more details. Please email Nashville_aikikai@hotmail.com with any seminar specific questions. Please see the following links for registration forms and release waivers. Registration must be received by Friday, March 9. 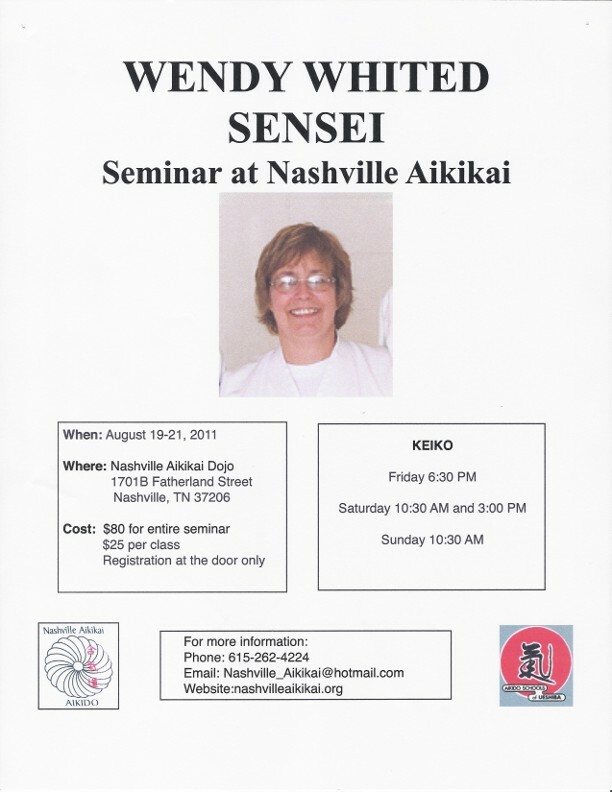 Any questions can be emailed to web@nashvilleaikikai.org. Thank you! Mark it on your calendar! What a wonderful opportunity to train with a fantastic teacher, it should be a great weekend!